Red is called often: The color of love. In Amsterdam we call it the color of De Wallen. 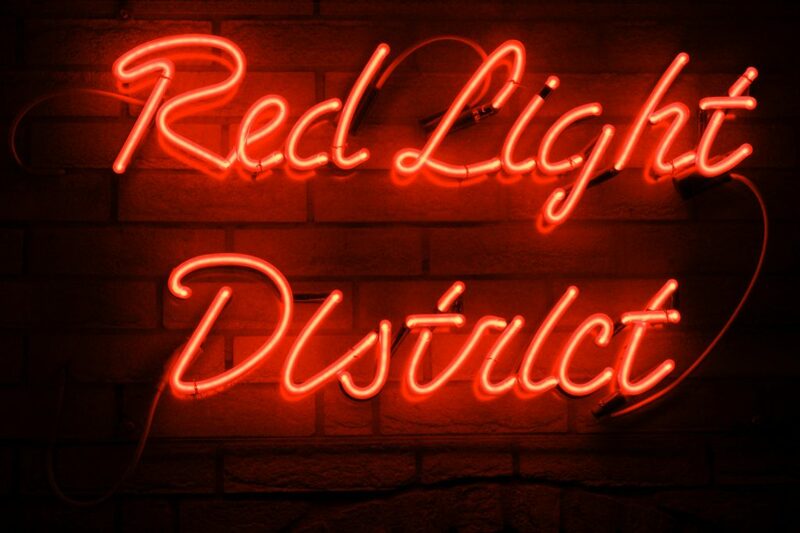 Better known as The red light district. The neighbourhood was used to be a haven. A place for sailor’s to relax and most important: to have fun. It became an area with many pubs and brothels. The red lights of the brothels in Amsterdam are world famous and that’s why we keep them, but they don’t have a particular function anymore. Because of our good health care system prostitutes can protect and cure themselves from STD’s. In the past they couldn’t and you can imagine that it didn’t really look pretty down there.. The red lights were used as a cover-up for all the itchy redness on their skin. Another reason why we call it The red light district is because of the Dutch widows who were seeking for love and attention. The Wallen used to be a haven. At that time it was a big risk to work on a ship. Only a third of the men made it back home. The women that were left behind lighted a red lantern to let the single men know that they were available and ready to date again. Ofcourse after a period of mourning. The red light district is a hotspot for tourists from all over the world. There are still many “windows” in the area. You can also visit the Museum of Prostitution: Red Light Secrets. Tey give you the chance to stand behind a window and experience how it feels to be checked out by so many people. It seems so easy to take a ride on the wild side in this part of Amsterdam and we understand.. What happens in Amsterdam stays in Amsterdam! But don’t forget to check out some cultural places of the red light district as well. At Zeedijk 1 you can find one of the two remained wooden houses from the Middle Ages. The house is called ’t Aepgen and is now a place to get a drink of have diner. Last, but not least we suggest to take a look at De Oude kerk. The church is the oldest remained building in Amsterdam. The church is the heart of De Wallen and is easy to find. Nowadays the church is a museum, an art gallery and a music theatre. On Sundays they still use it as a church. A good time for some confessions..